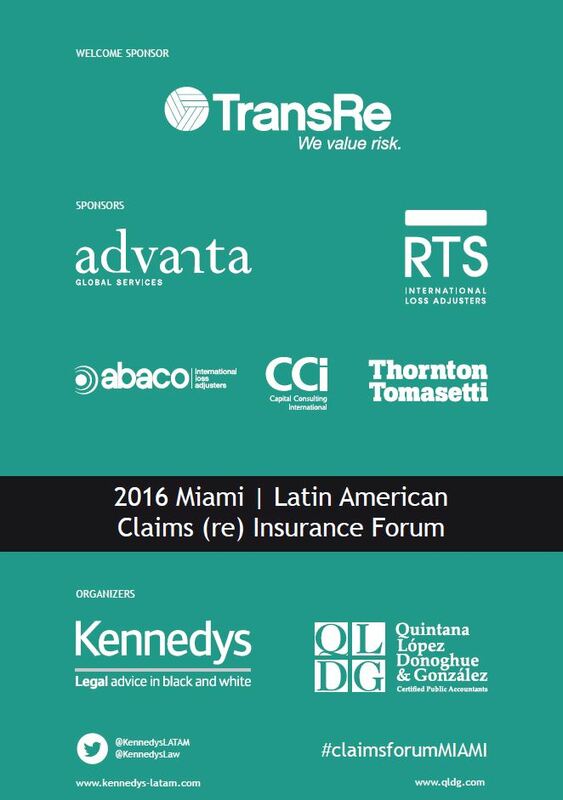 Our teams at QLDG and Kennedys have been working on the 2016 Miami – Latin American Claims (re) Insurance Forum since the closing of the 2015 Forum and the final program is now ready as attached. The speakers and participants include representatives from the following companies: TransRe, Zurich, Chubb, Liberty, AIG, AGCS, Marketform, XLCatlin, Munich Re, Swiss Re, Divina Pastora, Barents Re, Everest Re, QBE, Lloyd’s of London and Ironshore. In addition, we have key speakers from RTS International Loss Adjusters, Thornton Tomasetti, advanta, Capital Consulting International, abaco, addvalora, Exponent, R&G Espinosa, ATX, Kennedys and QLDG. The success of the event in 2015 proved that there are high quality professionals dealing with Latin American claims, and a desire to work and improve as an industry. We are proud that the market has entrusted us with the de facto mandate to act as a conduit for that to happen and, as such, there will be annual editions of the Miami Forum whilst that interest. Based on the feedback received from participants in 2015 and many contacts thereafter, the program for 2016 will again be highly interactive and will address not only theory and recent developments but also the most important topics based on case studies. Capacity is limited and is on a first-come first-served basis. Some people were not able to attend the 2015 Forum due to capacity limitations. As in the past, attendance is by referral only and it is non-transferable. If you know someone who might be interested in attending, please let us know and we will contact that person, with you in copy. Dress code is business casual and the forum is to be conducted in English. We would like to especially thank all of our sponsors and partners who joined us in bringing this LATAM claims Forum to Miami: TransRe, RTS International Loss Adjusters, advanta, Thornton Tomasetti, Capital Consulting International, abaco and BNamericas as our media partner. 3 intensive days of in-depth discussion. More than 15 countries represented. More than 40 industry leading speakers. Insurance Professionals Meetings in Miami is an insurance and reinsurance forum useful for professionals of the insurance sector and to share experiences, knowledge and expertise. This entry was posted in Miami Latin America Claims (re) Insurance Forum, Other and tagged Claims Seminar Latin America, Insurance Conference Miami, Insurance Events Miami, Insurance Seminars Miami, program: 2016 Miami - Latin American Claims (re) Insurance Forum. Bookmark the permalink. 2019 Miami Latin American Claims (Re)Insurance Forum is almost sold-out. Just a few seats left! Is LATAM ready for BIM? Upcoming Insurance Free Seminar in Miami: How do we understand General Average? Upcoming Miami Free Seminar: Regional Issues with BI: Does the Mexican Form Lead to a Windfall? & Potential Savings in “Continuing Costs”? Save the date: 2019 Miami Latin American Claims (Re)Insurance Forum! Upcoming Miami Seminar: Consulting Engineering Services in Latin America – Managing the local regulations and Idiosyncrasies. Cuba sanctions, a new era in the relationship between Cuba and the United States? Cuba, a newly emerging market?